Karla Yungwirth Designs: Pretty Cute Stamps - November Sneak Peek!! Oh My Goodness! You are going to love this month's releases!!! I get to feature the adorable Snowmies set from Pretty Cute Stamps November Release today :) We have had lots of snow and cold weather here already, so I have been keeping warm inside with a nice hot cup of tea and creating these cute wintry friends. I created the background by stamping the snow stamp (think of all the fun things you could do with this!) on watercolour paper with Versamark Ink and then heat embossing with white embossing powder. I then used a watercolour palette to swirl pretty colours in the background. I just love how the snow resists the watercolour! I handcut the snowy hills and edged them with Distress Ink and then layered the hills and Snowmies to create a scene. Love this sentiment - you could use it for a winter birthday, Christmas or just a hello card! I used white embossing powder to stamp these sweet Snowmies on watercolour paper before painting them. Watercolouring stamped images is so easy and one of my favourite ways to colour images. Inside, I stamped another awesome sentiment and popped up the mitten stamps with foam tape, adding a little bakers twine - we wouldn't want their mittens to get lost! I'm so glad you could join me today for this fun sneak peek! 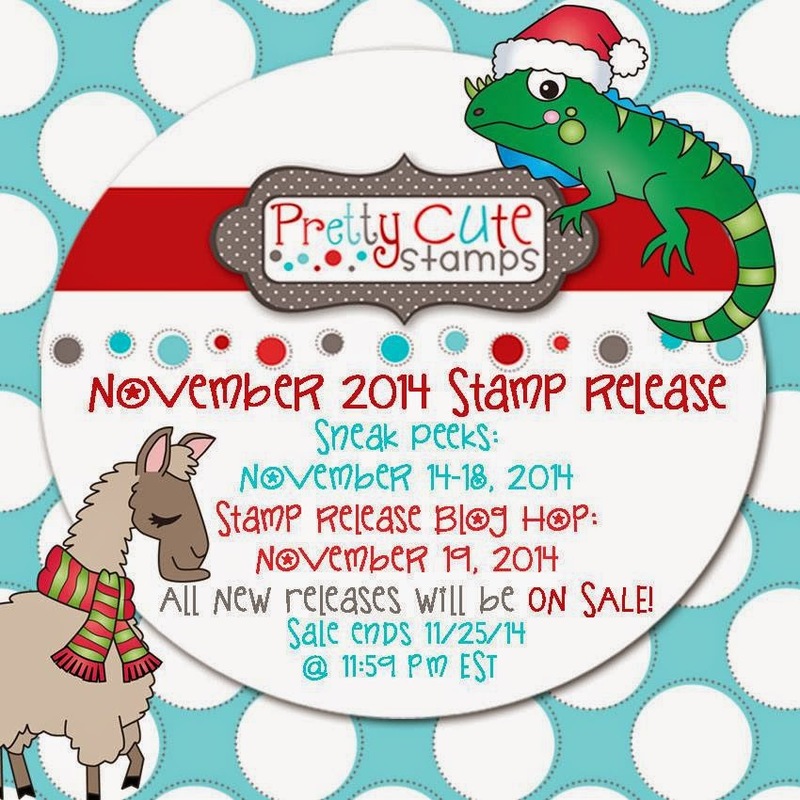 You can keep up to date with all the posts and new release info at the Facebook event and the Pretty Cute Stamps blog! Be sure to keep checking back for more amazing projects and the big November Stamp Release Blog Hop on November 19th where you will be able to find this adorable Snowmies (I just love that name!!) stamp set at the Pretty Cute Stamps store. Have an awesome weekend, full of craftiness and fun - and keep warm! !